MediaPlayer is a 100% assembly coded mpeg-2/mp3 decoder. It is not based on other codecs or libraries. Coding by V.Turjanmaa and A.Mogyorosi. TV/Radio player decodes DVB-T broadcasts with mpeg-2 video and mpeg-1 layer I,II,III audio. Tuner application is included to Menuet64 image. Subtitles are not supported. 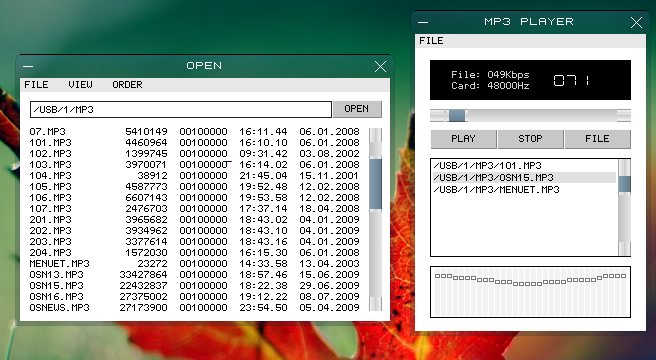 MP3 player decodes mpeg-1, audio layer I,II and III -files. Also variable bitrate (VBR) files are supported. Player includes a 32 band equalizer. Decoder supports mpeg-files with mpeg-2 video (ps) and mp3 audio. File player is included to Menuet64 image. 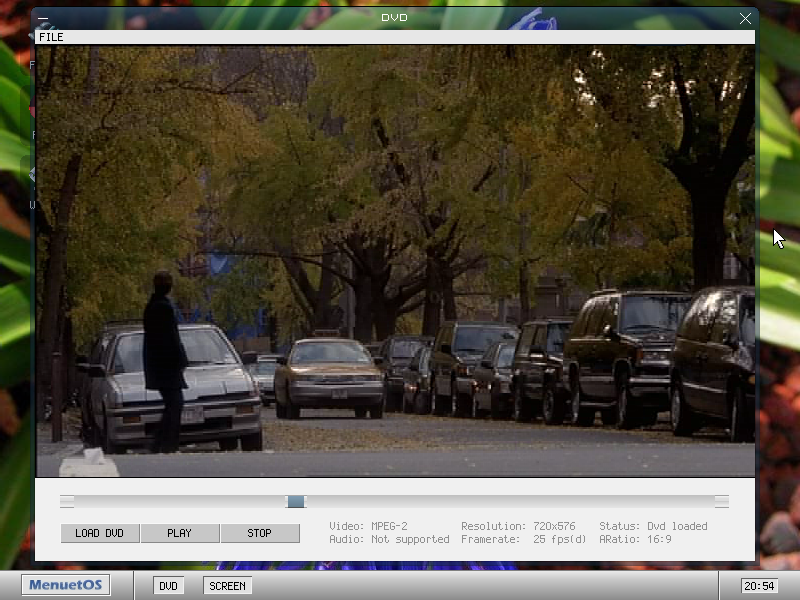 Player decodes non-protected PAL dvd's with mpeg-2 video and PCM audio. Also non-protected NTSC disks work fine in our limited tests. 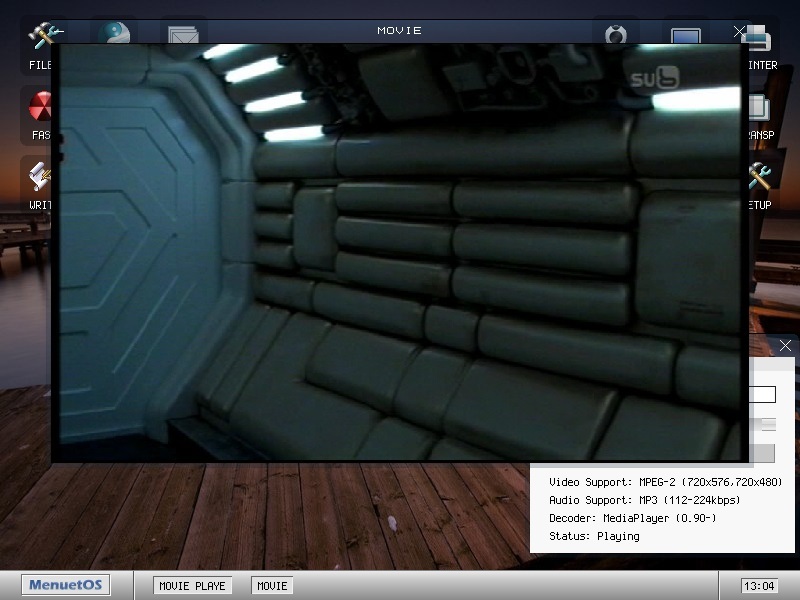 Current version supports PCM-audio, not dolby digital. Hope this help/inspires "someone" to grab/share ASM optimizations ! The 32 bit code is open, but the 64 bit is not. written in assembler doesn't necessarily mean it's optimized better than others. and the hardware where this would _really_ matter (tiny portable devices) is usually not based on x86/amd64. Portable devices usually use highly optimized embedded decoders for platforms like arm, mips, hexagon, etc. For desktop, an assembly optimized decoder would be nice if it targets modern x86 variants. If it's old 32 bit code, that's a lot less interesting. I don't think there is much interest in optimizing desktop decoders anymore however. Multicore processors have largely made that irrelevant.